The issue of stop and search is a leading story on broadcast and in the papers today. 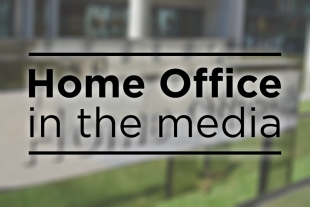 The Home Secretary was interviewed on Good Morning Britain today. He said that police officers should feel confident to use their powers. The interview also covered the public health approach to violent crime and police resources. Elsewhere, the Guardian (splash), Mail, Sun and Mirror report that police chiefs want to trigger an expansion of stop and search by lowering the level of suspicion an officer needs against a suspect to use the power. The Guardian reports that police chiefs want to scrap the requirement for “reasonable grounds” before a person is searched amid mounting concern over knife attacks. Stop and search is a vital policing tool and officers have the Government's full support to use these powers. The Home Secretary has said he wants police officers to feel confident, trusted and supported when they are using stop and search powers. We are looking at ways to work with the police to reduce bureaucracy and increase efficiency in the use of this power. The Sun carries an article on how the drug known as Spice could be re-classified as a Class A drug. The paper says the Home Office has asked the Advisory Council on the Misuse of Drugs to review whether the synthetic cannabinoid, commonly known ‘zombie drugs’, should be reclassified from Class B to Class A. Synthetic cannabinoids, such as Spice, have a devastating impact on communities, which is why we acted to legally control them as Class B drugs. This makes possession illegal and delivers longer sentences for dealers and manufacturers. We are now taking further action to understand and address the risk. We have asked the National Crime Agency to undertake a threat assessment of synthetic cannabinoids to provide a full picture of the threat faced by law enforcement. We will also be asking the Advisory Council on the Misuse of Drugs to advise on refreshing their 2014 assessment of the harms of synthetic cannabinoids. This will ensure we are relying on expert advice in considering any further action to take.